It seemed like we had been in seattle for years where it was hardly a few days. The morning was a bright sunny one. Perfect day for a perfect competition. Raka had stayed with me overnight and we left early morning for the university and reached there by 7.30. Had light breakfast and practiced some more for the preliminary round or in other words the semi finals. 5 out of the 14 teams were to be shortlisted after this round. At around 9, we left for the HUB where our presentation was scheduled at 9.30. We met Suzy there and she encouraged us more before our presentation. We entered the room with 7 judges and few audience at 9.30. The presentation was for 10 minutes. It went flawless – exactly as planned. The next 10 minutes questions and answers happened. They too went without any major hurdles. In fact we think we gave more than what was needed. It was a satisfied, happy and confident bunch of 4 that came out of the room. Lunch was scheduled for 11.30 and we decided to use the time and the excellent weather for some more exploration and photo clicking. We got a few minutes late for the lunch in this whole process. We had 2 of the judges waiting for us at lunch where in they gave us some valuable feedback and also questioned us more on our plan and the business environment in India with respect to our plan. The final five finalists were announced just as we were finishing our lunch. We were in. Through a random chit pickup we were slotted to be the 3rd one to give the presentation. We had not seen what the hall looked like or how many people were there inside. And it was a much bigger hall full with people that met us when we entered at the time of giving our presentation. We had the next 20 minutes with us and again we delivered what we had practiced so hard. We were much more confident this time around though made a few mistakes (which hopefully only we noticed). 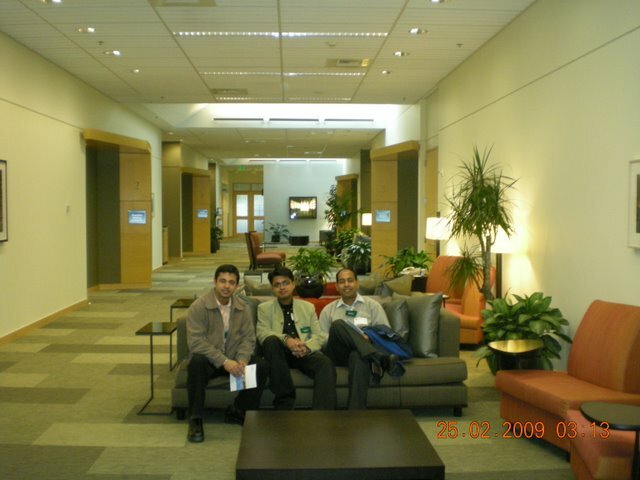 Ankit, raka and I came out after our presentation and roamed about in the university campus – much more relaxed. The results were not announced after the final round of presentations. They were to be announced at the Banquet Dinner at Fremont Studios. All the teams then moved to the venue then. The setup was lavish there. But before that, there was another round of elevator pitch with our posters setup – like the one we had on Wednesday. It was not a graded round so the atmosphere was much lighter. We also took the opportunity to interact to a couple of other teams and heard their projects. 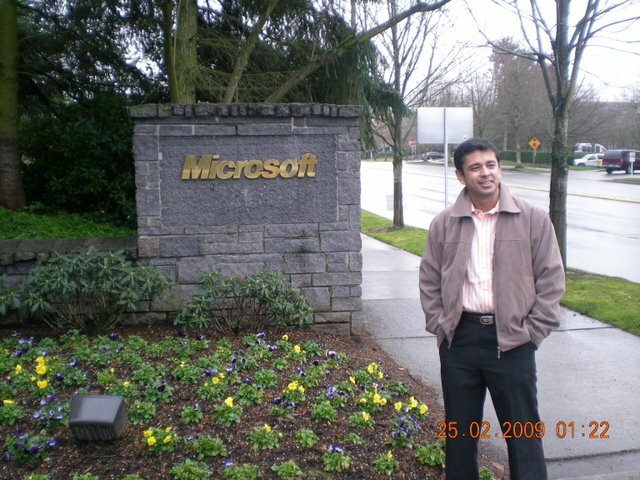 It was basically a time to network and interact with the top bosses of many companies like Microsoft. The most interesting, though was the one with the COO of Theo Chocolate – the Chocolate Factory in Seattle. We had heard about it the previous day and that it was open to the public where one could go in for a tour of the factory and see how chocolate is prepared. We were offered a tour at that very time. But it being not possible at that time, he offered us a pack of fresh chocolates. It was quite an overwhelming gesture. Meanwhile we were also interviewed by a TV Channel. It was time for dinner then. A full banquet dinner with all kinds of forks, knives etc were last experienced only at a sample lunch at Infy’s Cross Cultural training session. It was a first time real experience. Everyone was given a table number and it was made sure that a variety of people were seated at each table. 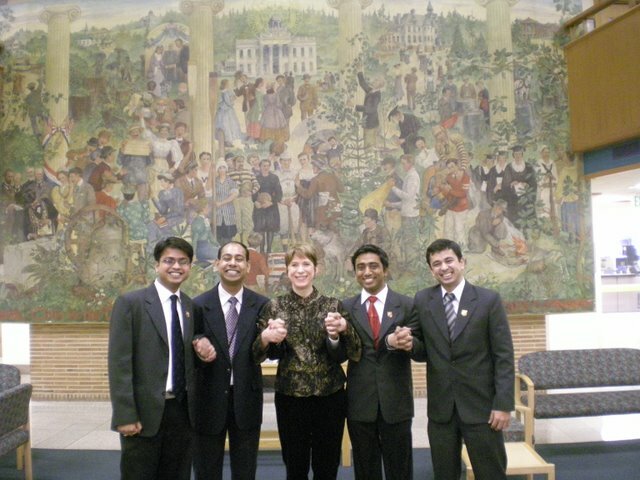 We had some nice discussions on cultural differences in India and US there. Time flew as we ate and talked. The keynote speaker on the occasion, Dr. William Foege gave an interesting presentation. Finally, it was time for the awards. The first one was the investors choice award – given for the trade show which was held on Wednesday. 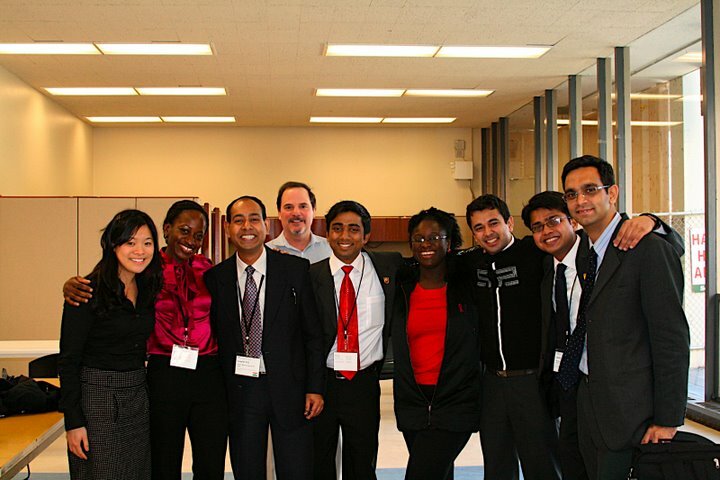 It went to the team from Princeton University. Next in line were the 2 prizes by department of global health. We were strongly expecting to get one of these. But there was disappointment when we didn’t win either of the two. A slight dejection feeling was sinking in now. 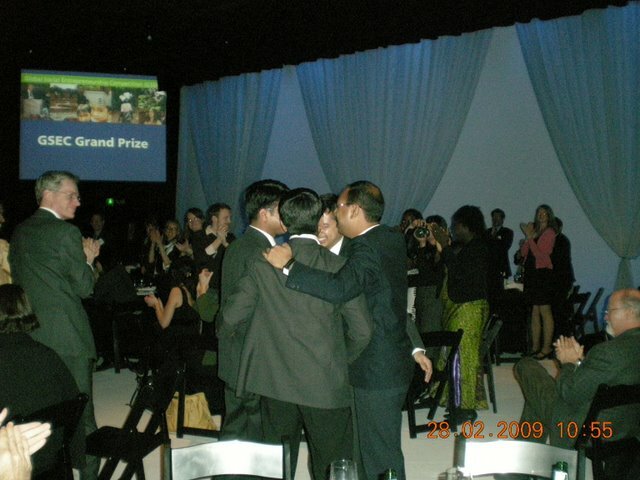 It was the final award – the Grand Prize of $10,000. 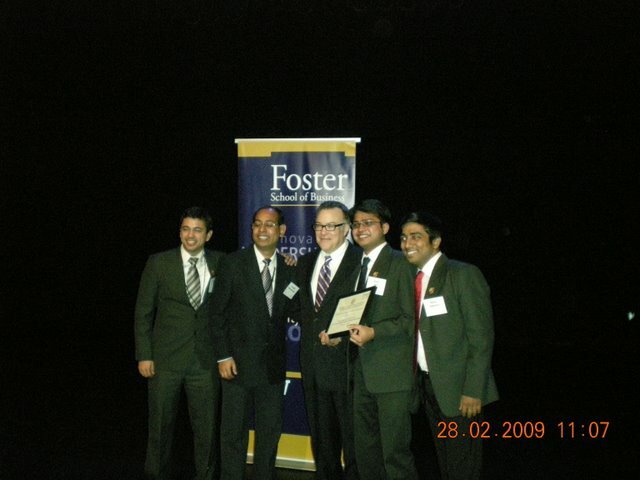 And there was that euphoric moment when our name was announced as the winners. The moments after that are in a blur. We hugging, getting a standing ovation, going to stage, hoards of cameras clicking, everyone wishing us. We first went to Suzy who had patiently guided us all along followed by photos and more photos. And then suddenly everything ended. I took a cab back to Anu’s place, went out for a dessert in a fabulous hotel downtown. We had a flight early morning the next day. It was already 2AM. So Anu, raka and I had a night out. 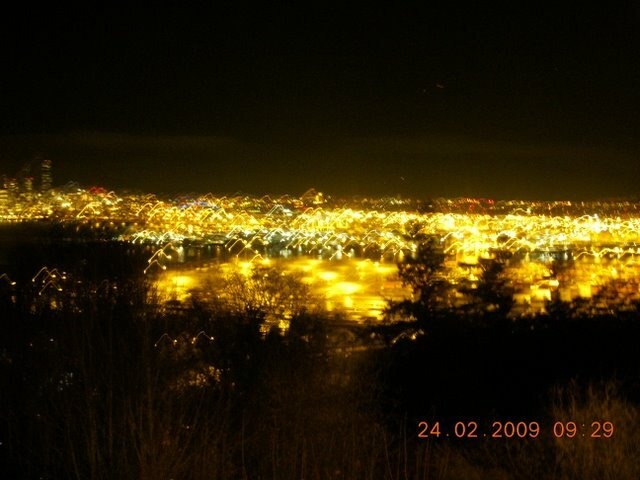 So some of the last moments at Seattle were quite similar to when we arrived – dark outside, a beautiful view of the city and the lake from Anu’s living room with the space needle promptly standing out amongst it all – similar to the last 8 days which simply stand out in the life till now. What a start to the day. As usual got up at 5 and it was a city covered with snow that said Good Morning! 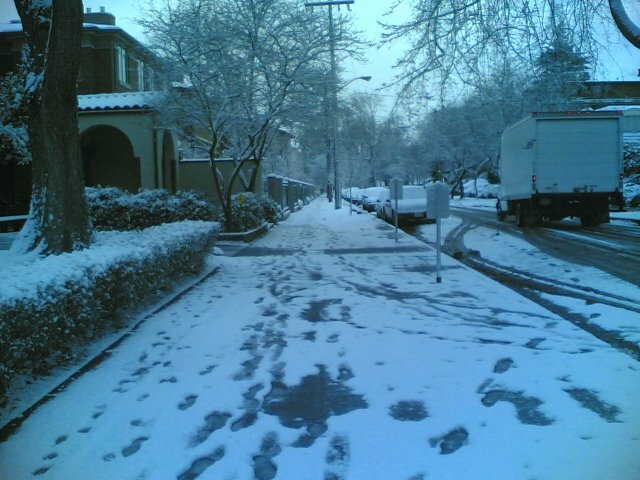 It had snowed through the night and it was serene everywhere. The real problem started later. The bus service was badly hit. No buses were plying. I waited for it for around an hour. Ordered cab – and again waited. Finally, Binay had to drop me on his way to office. And it was just in time for the feedback session presentation scheduled at 9.30. Here we gave the presentation which was supposed to be a final drill for the grand competition next day. The judges gave us feedback on which we worked on for some time. In between we also found out time to have photo ops in the snow cover around the campus. 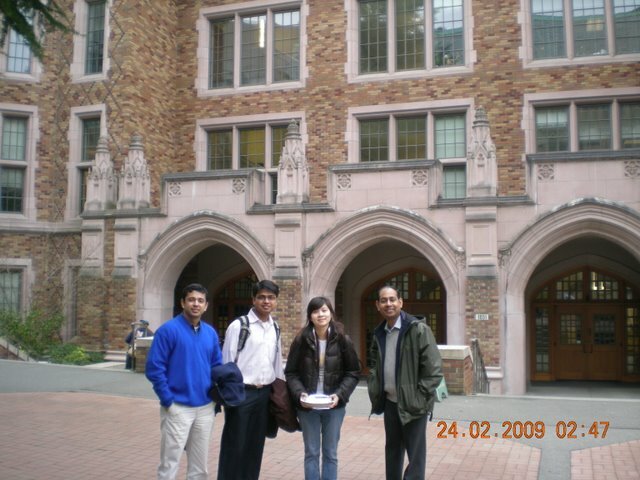 Sreejith booked an appointment with Suzy – the faculty for communications and leadership programs at UW. She is a former theater actor and teaches presentation skills. She spent more than 2 hours with us – giving us tips, suggestions and hearing out our presentation – and helping it to completely revamp it. All this while we also made new friends – all from different countries from Ghana to Canada to Mexico – everywhere. The day ended with Raka and me running to his friends house in Redmond and getting his stuff over to Anu’s place so that we could leave easily for the airport next day. 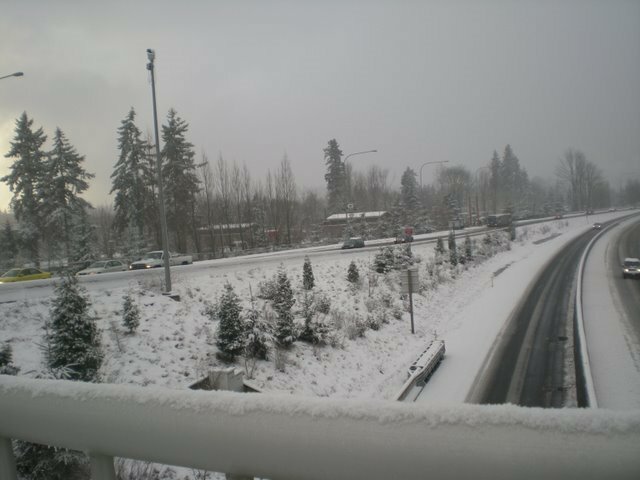 So it was 48 to Montlake, changing to 545 to Redmond. Back on 545 to MontLake and then 43 to Broadway. We are now adept at moving around in Seattle.. 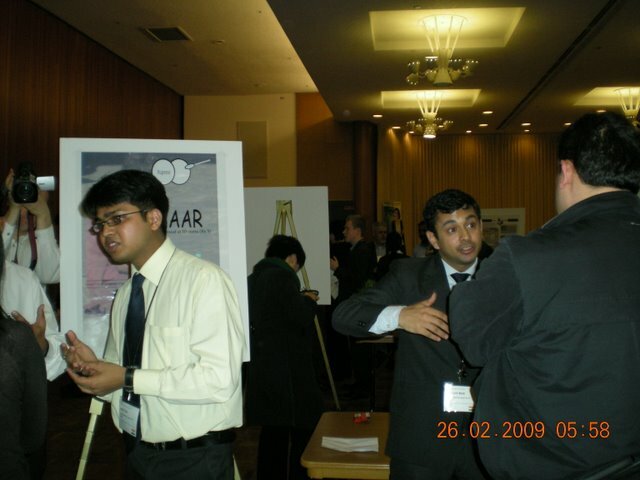 It was followed by the first competition – The trade show. It was an interesting concept. All teams were given spaces in a big hall where they had to set up their posters and make elevator pitches – basically 1 – 2 minutes of pitch to potential investors who would come to them. There were 25 mock investors who were given $1000 and they had to divide that into 3 teams which they think that would give them the best returns. It was a long 2 hours. With all of the investors coming in each one of us kept on talking the same thing over and over- again and again. And it went on more than 2 minutes. There were questions from everyone which had to be handled up to the last detail. Ultimately it was an incredible session – a first experience which left us mentally and physically drained. The trade show was followed by dinner where through a ice breaking session we interacted with some other teams. A practice round of presentations where we would get feedback as a preparation for the final thing was scheduled early next morning so despite the extreme mental exhaustion preparation had to be done for it and an hour’s session followed the dinner. As I reached home an interesting weather was taking shape – it started to Snow! It’s amazing how much you can experience in a day. It started with a visit to Microsoft. The most amazing experience there was the Future Home designed by techies at MS. It was futuristic – but not so futuristic. It was very easy to believe that such homes would be a reality in the next 5 – 10 years. It used simple technology of RFID (in everything that there is at home) and light bulbs with smart chips (not at all an expensive option in near future). Just few examples of the usage – which we actually saw in the future home. You take out milk from the refrigerator and place it close to the mixer. Some recipes involving milk which will be used in a mixer will be displayed on the kitchen surface from an overhead intelligent bulb. If you chose a recipe which, say involves choco chips and the refrigerator doesn’t have it, the Home will announce that you are out of choco chips and cannot make that particular dish. Further, what you have on your computer screen can be seen on the TV or the walls of the room. When we wanted to see where the planet Jupiter was w.r.t the sun, the whole room got converted to a planetarium showing Jupiter’s position. There is no need to paint the walls. You can have it re-designed as and when you like by just by announcing to the home that you need some kind of a setting. It will change the color on the wall, change the photographs on the electronic photo frames – basically you won’t feel it is the same room. It’s tough to describe the whole 1 hour experience in which we actually were in the future. 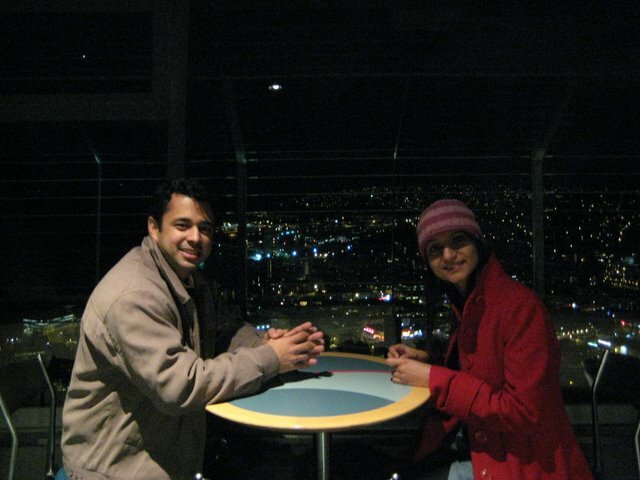 After this awesome experience, Binay, Anu and I went to the space needle. The 360 degree view of Seattle from the top of the 600 foot tower is breath taking. More than that it is fascinating to see how the Americans market it. Cameras were installed on the top and you could see the whole city standing at one place and moving the camera with a joystick. Interactive touch screens were installed to give information about the part of the city that you are viewing at a particular point. We got out of the air conditioned enclosure only for a few seconds and were blown away by the super chilly winds at that height. The dinner was Pan Asian today and time to again learn something – using chopsticks. I learnt it quite quickly and went on eating for sometime using the sticks but it was tiring after some time. Such a fascinating day full of experiences is of course tiring and it was tough to think of anything else apart from the bed on reaching home. The first official day of the GSEC week. And it was quite awesome. The day started early with leaving for the college early. It was a bright sunny day. Sreejith and I landed up in the Balmer Hall – a common room where we sat comfortably with our laptops and tried to access the net. There were few terminals where the net kept on disconnecting at frequent intervals. After working on the presentation for some time we moved for lunch and a tour of the UW with our student ambassador. Lunch was Mexican – Chicken Burrito. It is like a big Roti which has lots of things like rice, salads, chicken etc stuffed inside. Tough to eat the whole but I was hungry. 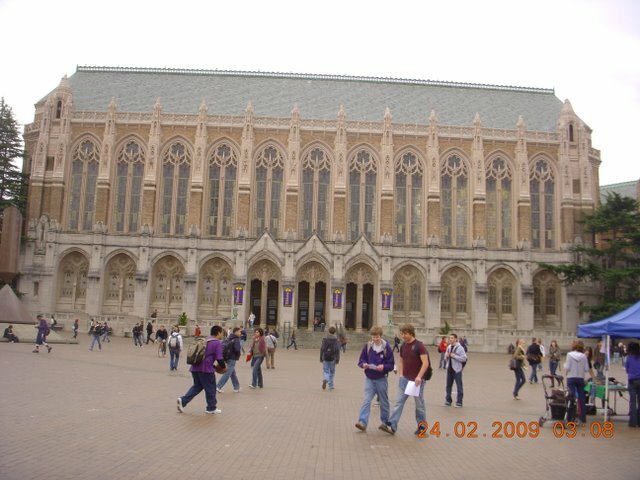 Duong Dang, our student ambassador took us for a tour of the beautiful UW campus. The most fascinating was the Suzzallo Library. Tough to resist comparing your own library with the one here. But not tough for me as there was no comparison at all. It was a visit to Path – a company involved in global health by technological innovation. Met some other teams from different countries here. And it was quite amazing to sit around a table with from so many backgrounds and listening to them. The Pat h had some interesting innovations which it was trying to bring to the improve health in collaboration with different partners in the developing countries. In the evening it was time to try another cuisine – Italian. And it was not the simple Pizza that we generally think of under the Italian category. Under Anu’s able guidance we had Bruschetta, Rivoli, Gnocchi, Tiramisu and Mussels – though now it is tough to remember which was which (Excuse me for any spelling mistakes I have done in these dish names). Damn I am getting more interested in trying out new cuisines. After dinner it was a ride to the east side of Seattle from where we could get a magnificent view of the city.